Almost everyone encounters problems at some point in a relationship. It can be very frustrating to have difficulties with your partner, especially if you are arguing a lot or can’t find a way to connect like you used to. However, if your relationship is built on a strong foundation it will be possible to find a way to fix it. 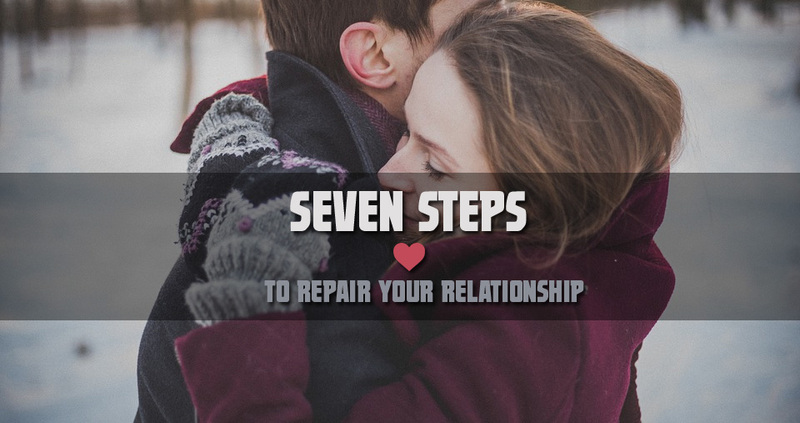 Here are seven steps that can help to repair your relationship. There are all sorts of reasons that a relationship can start to have problems. It could be that you find that you constantly argue without ever reaching a conclusion or maybe it’s the case that one partner feels like they are giving more to the relationship than the other. No matter what the problem is – you need to establish the reason that are you having issues. Remember that living in denial won’t do anyone any good. Once you’ve established the problems you have with the relationship it’s time to have a frank and honest discussion with your partner. Bring up your feeling that there is something wrong with the relationship and open up about the way you feel about it. It won’t do any good to be angry during this discussion – approach it calmly and gently so that your partner can feel at ease. Remember that when you’ve had your say you need to listen carefully to your partner’s response. If they view the relationship differently you need to try to empathise with their feelings. The most important thing to understand is that there are going to be two sides to every relationship. Things that you consider a problem might not be an issue for your partner and vice versa. You need to find ways to find common ground and understand each other’s point of view. Discuss what you need from the relationship that you aren’t getting and allow them to share their side of the story. You might find that once you’ve told you partner something is a problem, they will find ways to change things for you. For other issues it might be the case that you need to find a way to meet in the middle. If you are still finding it difficult to communicate effectively or come to any agreements on ways to move forward, it could be a good idea to consider couples counseling. Experienced counsellors and therapists can help guide you through the process of talking to each other in a way that’s effective. Speaking in a safe and controlled environment, you might find you are able to be completely honest with your partner about the challenges you face in the relationship. You might find that as your relationship has started to develop problems that you have made less time to spend with your partner to avoid arguments or conflict. Unfortunately this can lead to the issue that you are no longer connecting or spending quality time together. It can also be an issue that people slip into a routine where they always see something at the same time. While it’s good to know when you are going to see your partner, it can lead to the relationship becoming stale if there is no excitement or variation. You should make the effort to do things you don’t normally make time for. While it’s important to see your partner regularly to re-establish that connection you have been missing, you will also benefit from spending time on yourself. One common problem individuals have in relationships is that they begin to lose their independence. If you find that you are no longer doing the things that you used to love it can become a strain on the relationship. Make some time for your own interests and learn to enjoy the free time you spend away from your partner. If you’ve been through a tough period, it’s a great idea to start doing the things you used to do when you first got together. Go on dates, spend evenings just talking to each other and make plans together. Going back to what you used to enjoy the most can be a wonderful way to rekindle the romance in a relationship. Article provided by Mike James, an independent content writer working together with Sussex-based CBT, Life Coaching and Psychotherapy specialist Brighton and Hove Psychotherapy.